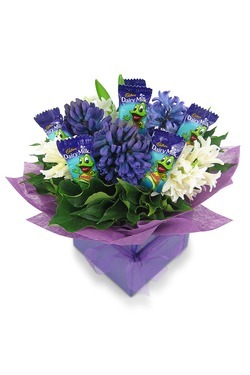 We have some beautiful bold native flowers in Australia and we also have some really nice chocolates. 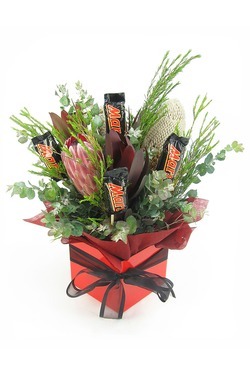 Aussie natives contrasted with the smoothness of soft Mar’s Bars makes this arrangement a hit. Quick history lesson: way back in 1954, the Mars bar was introduced to Australia and then to our horror it was first deep fried at the Carron Fish Bar in Stonehaven, Aberdeenshire, Scotland in 1992. What were the Scott’s thinking?? 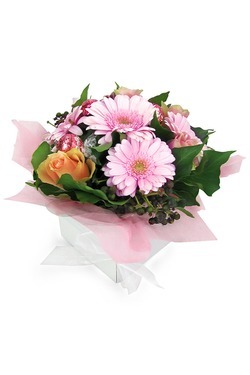 We love Gerbera’s because they will brighten up any room. We decided to do our take on a Gerbera potted plant. 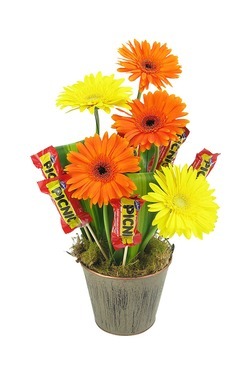 Bright Gerbera flowers placed in a cute little metal bucket with moss as the soil. We added Picnic bars to symbolise…. well actually we just added them because they are delicious! Enjoy. Some days we just want to relax and let somebody else make all the decisions. So, how about we choose for you? 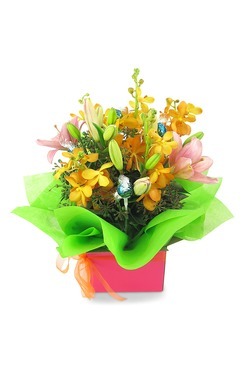 Send a Florist choice mixed petite posy of seasonal flowers with assorted star milk chocolates. 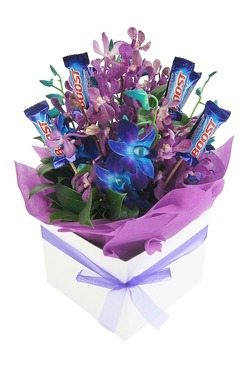 Our florists will pick the best seasonal flowers, combine them with some very yummy star shaped chocolates and you’ll get all the kudos, win, win!. 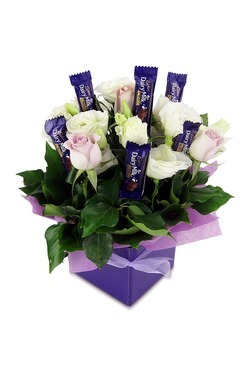 Mini gerbera’s and roses combined with Lindt balls and packaged up in a cute box make this arrangement ‘Dainty’. 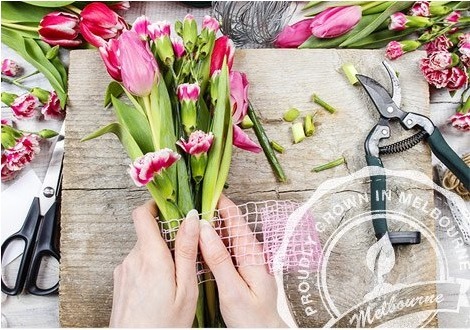 The Lindt chocolate’s in the arrangement are made by master Swiss chocolatiers and then hand placed in our arrangements by our master florists. Did we mention that we love gerberas? Check this one out. Lovely and delicious, this may well be the perfect gift! A fun display of gerberas with Chocolatier chocolates in a box and tied with a ribbon. Do you remember the first time you saw a sunflower? It looked huge! 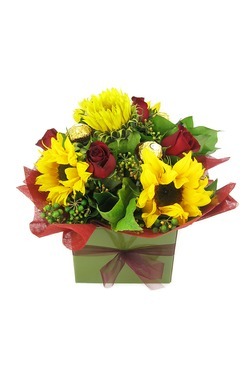 Summertime is the time of sunflowers, pair them with some beautiful roses and a few sneaky Ferrero Rocher chocolates and we have a great summer-style arrangement. A well-known sunflower characteristic is that the flowering heads track the sun’s movement, a phenomenon known as heliotropism. Made for the young at heart, this one’s straight from our childhood, with the idea being to dip the Chupa Chups in the sherbet and make a great, fizzy fun combo (as if you didn’t know that!). When your friend comes down from their sugar high, they’ll be able to enjoy some bright green chrysanthemums and fluoro gerberas. We wanted a luxurious arrangement, and roses were a must! The treat combination was difficult to agree on, but after LOTS of testings, dairy milk chocolates it is. Rumours circulated in our workspace about a children’s party treat where a single Freddo frog is left to float alone in a bowl of jelly before being consumed by sugar crazed toddlers. Here is a much more sophisticated alternative minus the reality of the toddler party! Besides, one Freddo is never enough. Let’s face it, midnight is there for one reason, and the reason being…snacking! This box is sticking it to “The man” who says that eating too much chocolate at midnight is not good for you. Well, we say, mind your own business! Enjoy your late night treats. This one’s a sweet arrangement featuring Chupa Chups and orchids in a ceramic pot. 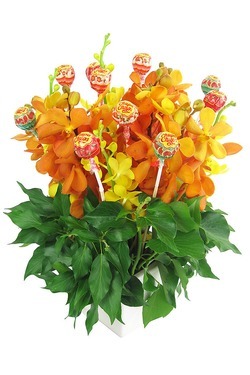 Chupa Chups and orchids are one of my favourites and judging by the amount of Chupa Chups that keep on disappearing, it appears to be a favourite with others too! 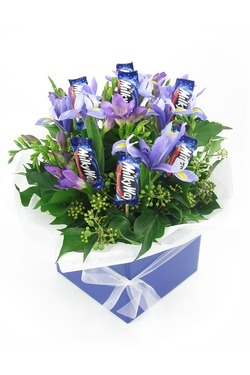 Mmmm hmmm you know it looks good, an utterly divine arrangement of freesia’s, iris and greenery with added MilkyWay chocolates throughout. Send this to anybody and they will certainly be happy. Dreaming of a tropical paradise? This is possibly the next best thing, and at least the chocolates are less likely to melt. Filled with lilies, orchids and tasty Lindt chocolates. We found some cute mini fish bowls and just had to use them. 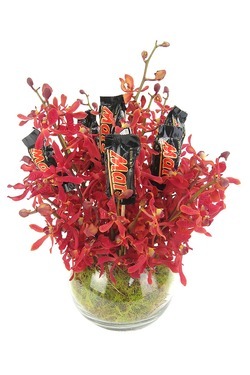 So we have combined some beautiful tropical orchids with delicious Mars chocolates (the bowls are not ideal for fish BTW). 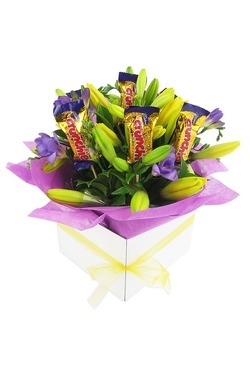 Here is our fun mix of lilies, freesias and tasty Crunchie chocolate bars! 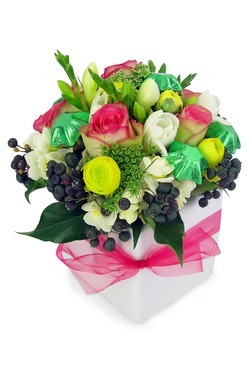 Presented in a bright boxed arrangement and tied with a ribbon. Random trivia: In the UK back in the 60’s a range of limited edition Crunchies went on sale. These included a lemonade bar and a tango orange bar, yum! Then In 1999, they bought out a unique champagne-flavoured bar for New Years Eve. Picture a cold Melbourne day, now imagine a knock at the door “Knock Knock” you open the door to receive a sweet posy of gypsy and erlicheer presented in a teacup and surrounded by delicious Tim Tams. 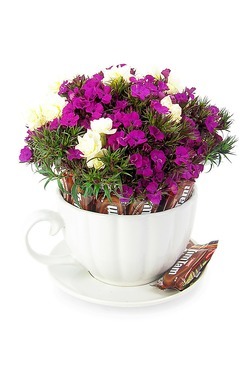 Make yourself a nice cup of tea (in a different teacup), dunk those Tim Tams and relax with the sweet scent of tea, chocolate and erlicheer flowers. Your day just got better. Unknown to most, cherries are related to the rose family, so we decided that Cherry Ripes are also related to roses. 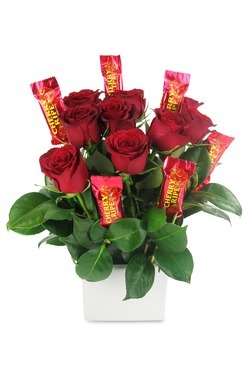 Together they make a great combination, so behold – gorgeous roses paired with delicious Cherry Ripe chocolates, beautifully displayed in a ceramic cube and tied with a ribbon. 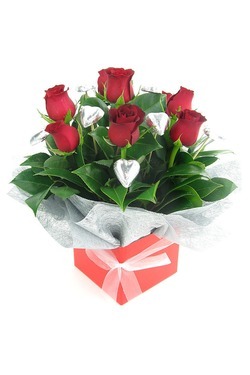 These would make a fantastic Valentine’s gift for that somebody special. We love a good mixture of colours and different treats. 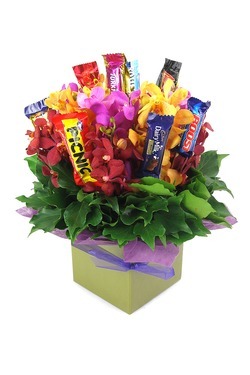 Make someone’s day by sending a box arrangement of bright mixed orchids and an assortment of delicious chocolates. Fun Fact: There is an orchid that looks like a monkey’s face, one that mimics a bird, another resembles a duck in flight as well as a stack more strange looking orchids that look like something other than flowers. The photo says it all with this bunch, how happy does it make you feel just looking at it? 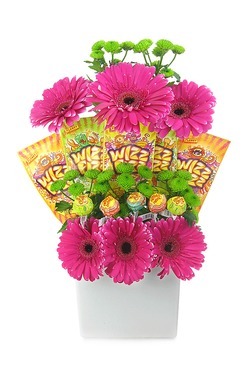 Send happy, cheerful gerberas and Chupa Chups combined in a tin arrangement to brighten someone’s day. 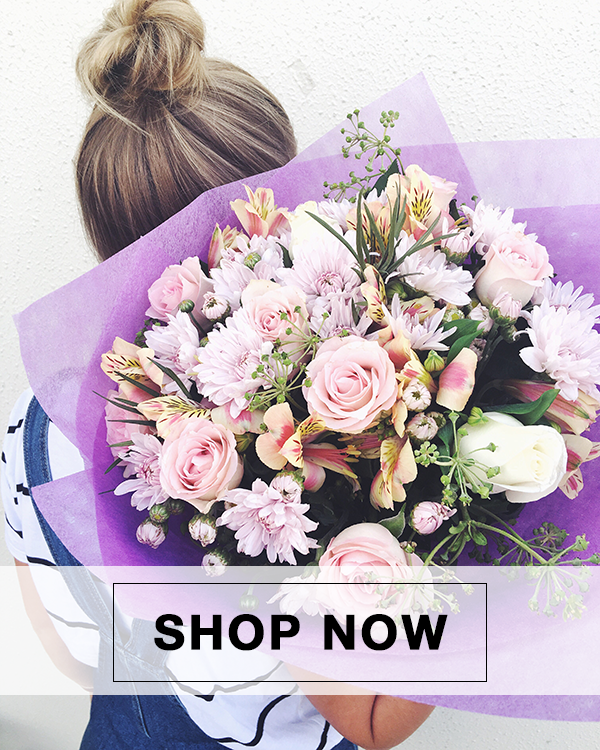 Send a stunning bouquet of fluffy lisianthus and delicately scented freesias combined with delicious Ferrero Rocher’s to make someone’s day ultra special. Here’s a Random Fun Fact: The hazelnut found at the heart of every Ferrero Rocher, is specially chosen for its size to ensure the best possible flavour. Tea and Tim Tams – just two of our favourite things! They go so well together we couldn’t help but match them up with something that should take centre stage on the tea tray right next to the teapot – flowers! 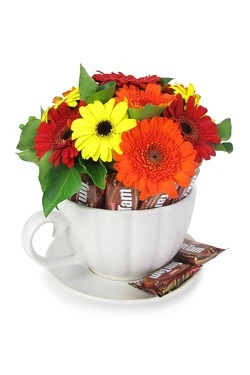 Send bright, happy mini gerberas in a tea cup complete with individually wrapped Tim Tams to brighten someone’s day. 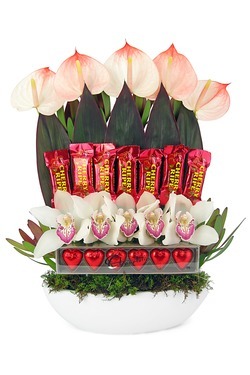 A modern collection of anthuriums, leucs, tropical leaves and gorgeous cymbidium’s arranged in a ceramic container complete with Cherry Ripes and Chocolatier heart chocolates. Anthuriums are often given to represent a deep romantic attraction. 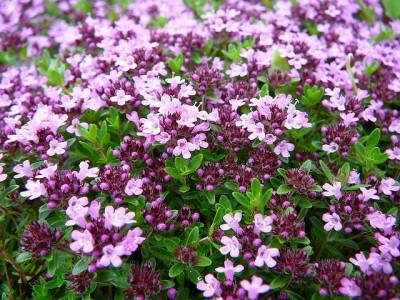 This is due to their beautiful yet unusual appearance. Add chocolates and its a winner! 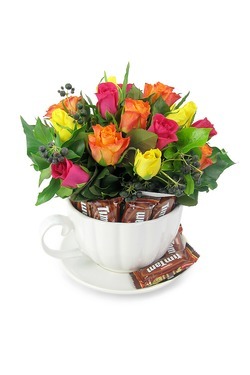 Behold here is another variation of a teacup packed with yummy Tim Tams and a gorgeous posy of 12 short roses. According to Victorian Flower dictionaries, a rose’s colour determines its meaning. Red roses signify “love,” pink ones mean “grace,” peach signals “modesty,” and orange implies “fascination.” All we have to say is that Tim Tams are delicious with or without a cup of tea, and all roses are beautiful.